Kate Warne truly gets muscled out when it comes to the establishment of one of the first detective agencies in America. She is certainly one of the first female private eyes (there had definitely been operatives before but none that made it their permanent career). There were few career opportunities for women in the nineteenth century. The Victorian role model was that of wife and mother, and society would permit few deviations from the norm. Few medical schools would accept women, and fewer colleges and universities. Police work was considered to be a male domain, too dangerous and rough for a woman to even contemplate. Kate Warne was and is something of an enigma. There is little real information on her personal life or background. There can be no doubts about her accomplishments, however. Not only was she a trailblazing pioneer in detective work, she also became a kind of prototype for the Secret Service agent. Described by Allan Pinkerton as a slender, brown haired woman, there is not much else known about Kate Warne prior to when she walked into the Pinkerton Detective Agency in 1856. Born in New York, Warne became a widow shortly after she married. In answer to an ad in a local newspaper, Kate Warne walked into Allan Pinkerton’s Chicago office in search of a job. There is still debate whether or not she walked in with intentions to become a detective or just a secretary. Women were not detectives until well after the Civil War. Allan Pinkerton himself claimed that Kate Warne came into his agency and demanded to become a detective. At the time this was simply unheard of. However, Kate argued her point of view effectively—pointing out that women could be more useful in worming out secrets that would be otherwise difficult to acquire by a male detective. A woman would be able to make friends with the wives and women around suspected criminals and gain their confidence. She also argued that women have an eye for detail and are excellent observers. Warne’s arguments swayed Pinkerton, who at 10 o’clock on the morning of August 23, 1856 employed Kate Warne as the first female detective (in America, and quite possibly the world). Pinkerton soon had a chance to put Kate to the test. Would her gender, as she had argued, be more effective in infiltrating where male agents had not? In 1858 Kate was involved in the case of Adams Express Company embezzlements where she was successfully able to bring herself into the confidence of the wife of the prime suspect, Mr. Maroney. She thereby acquired the valuable evidence leading to the husband’s conviction. Mr. Maroney was an expressman (basically a shipping merchant) living in Montgomery, Alabama. The Maroney’s stole $50,000 from the Adams Express Company. With Warne’s help, $39,515 was returned. Mr. Maroney was convicted and sentenced to ten years in Montgomery, Alabama. In early 1861 a plot was uncovered to assassinate President-elect Abraham Lincoln before he could be sworn in as chief executive. Lincoln was going to travel by rail from Springfield, Illinois to Washington, a journey estimated to take about eleven days. Normally, such a trip might only take about 5 days, but Lincoln planned to make many speaking engagements en route. The assassination plan, known to history as the “Baltimore Plot,” took place in 1861. Since there was no direct rail route to Washington D.C., Lincoln’s train would stop at Calvert Street Station, where the cars would be detached. The cars would then be pulled by horses across town and attached to another engine at Camden Station. The conspirators hoped to strike during this cross-town transfer. In fact, they hoped Lincoln would travel the distance in a carriage, not a railroad car. It would make him easier to attack. Maryland was a border slave state, and Baltimore was notorious as a hotbed of secessionist feelings. Lincoln was reluctant to go undercover, or to “sneak” into Washington. He did not want to look foolish or cowardly. But there was enough evidence to suggest the plot was real, so he agreed to change his plans. Lincoln donned an overcoat and hat—abandoning his signature “stovepipe.” His role was that of Kate Warne’s “invalid brother.” Warne purchased tickets for herself and her “brother,” and saw to it that the rear sections of a sleeping car were secure. Kate charmed the conductor into keeping the back door of the sleeping car open, so that her “sick brother” could enter in privacy. The President-elect’s entourage included Warne, Pinkerton, another detective named George Bangs, and Lincoln friend Ward Hill Lamon. Warne was armed, and took her turn staying up the whole night guarding the President-elect’s compartment. In this way, Warne could claim to be the first woman presidential guard, a kind of Secret service prototype. Lincoln, of course, managed to reach Washington safely. Kate Warne continued to work for Alan Pinkerton after the Civil War, and to his credit he often praised her work and dedication. 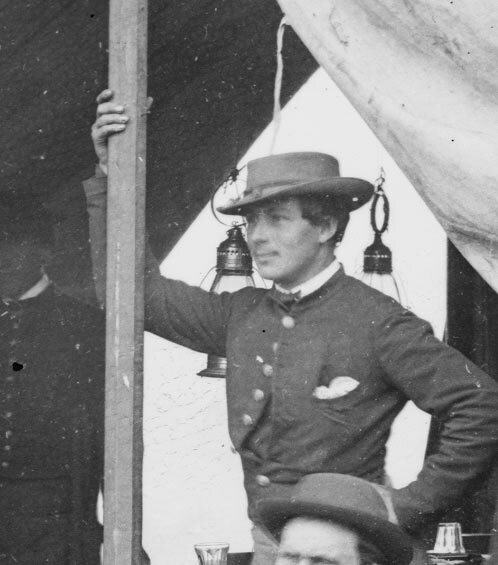 During the American Civil War, Pinkerton and Warne were used as a covert war intelligence-gathering bureau. She could easily penetrate into southern social gatherings. Warne said that women are most useful in worming out secrets in many instances. Believed to be a mistress of Pinkerton, the two would often pose as a married couple while undercover. She also had an assortment of aliases—Warne was known as Kitty to Robert Pinkerton, Allan’s brother. Robert Pinkerton often argued with Kate Warne over expenses turned over to the agency, but her relationship with Allan remained solid. After the quelled assassination attempt on Abraham Lincoln, Kate continued to travel with Allan Pinkerton as his Female Superintendent of Detectives. On April 12, 1861 at the beginning of the Civil War, Pinkerton wrote to the now President, Lincoln, offering the services of the Pinkerton National Detective Agency. However, before Lincoln could respond, Major General George B. McClellan asked Pinkerton to set up a military intelligence service for McClellan’s command. By the end of July, 1861 Pinkerton, Kate, Timothy Webster and later George Bangs set up a headquarters in Cincinnati, Ohio. After successfully delivering the president elect to the White House, Kate worked on various high profile cases. One of these involved the murder of a bank-teller, George Gordon, in Atkinson, Mississippi. The murderer got away with $130,000. Pinkerton determined that George Gordon was fetching money for a friend or someone who frequented the bank when he was bludgeoned with a hammer in order to eliminate witnesses of the robbery. Through his investigation, Pinkerton felt certain that his prime suspect, Alexander P. Drysdale had in fact killed Gordon. However, at this point he did not have enough hard evidence to convict Drysdale; too much was still based on speculation. Therefore, he set a trap for Drysdale so that he would reveal a confession. Kate Warne was sent under cover as a Mrs. Potter and became close friends with Mr. Drysdale’s wife. Through this plot, they were able to uncover where Drysdale had hidden the stolen money. Another case involved a plot by Mrs. Annie Thayer and Mr. Pattmore to poison Mrs. Patmore. Captain Sumner, who brought the case to the agency was also a potential victim. Warne took the name Lucille and took on the role of a pseudo-fortune teller to lure information out of the suspected murderer’s confidants. In the meantime, she also continually coordinated Pinkerton’s other female detectives in the agency. Pinkerton rented a space for Warne to work as part of her guise. Pinkerton named Kate Warne one of the five best detectives that he had. Her convincing Pinkerton to employ her was a significant moment in woman’s history.